I got this lovely edition of The Beast Must Die at the Dormouse Bookshop on Elm Hill in Norwich. It’s part of a list called The Holiday Library and has a sort of Everyman elegance which really appeals to me. The publisher, John Lehmann, was a significant figure in the literary life of the ’30s and ’40s. Cecil Day Lewis (a future Poet Laureate) was also known as the crime novelist Nicholas Blake. ‘The Holiday Library is a new series of modern reprints. It consists of outstanding works of fiction, biography and autobiography’ – all published at 6s. 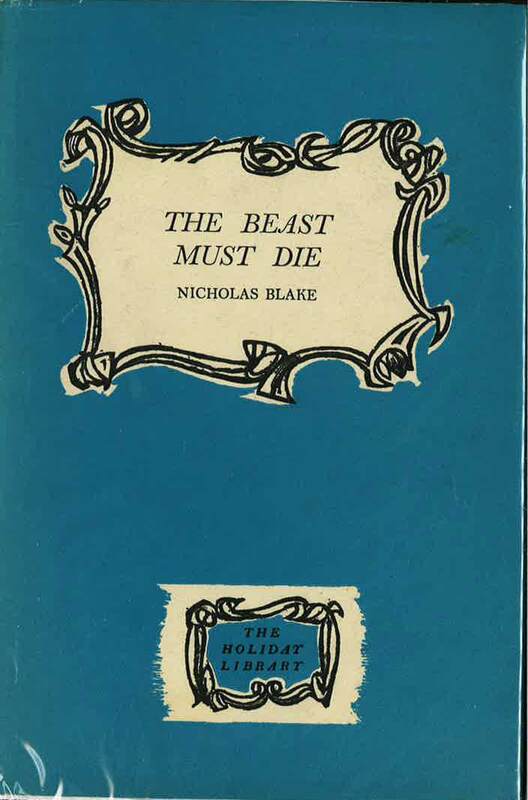 The Beast Must Die and the cockney classic They Drive by Night are the only crime titles amongst the first 18. I’ve praised the new Vintage covers for the Nicholas Blake series previously. 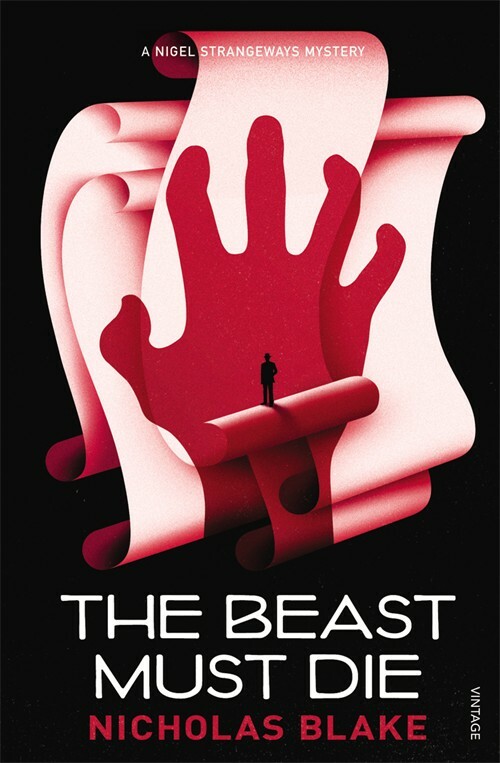 Here’s the cover for The Beast Must Die. The first part of the book takes the form of a diary written by one Frank Cairnes, who writes detective novels as ‘Felix Lane’. ‘Felix Lane’ is going to kill somebody. For real. Cairnes’ motive is a good one: his son Martie was killed in a hit-and-run accident six months previously. The killer escaped capture, and in any case the punishment meted out by the authorities would have been inadequate in Cairnes’ view. He is going to hunt down the driver himself. It needed something to keep the wound open: these toys are a better memorial than the tombstone in the village, they will not let me sleep, they are going to be the death of someone. The diary is his safety valve. He knows that murderers are driven to confess, but believes that he can ‘confess’ to the diary and so maintain a semblance of normality before and after his crime. Cairnes’ problem is that the police found no leads at all. However, a (frankly unbelievable) coincidental meeting with a yokel with an improbably accurate memory gives him the information he needs to begin his search. The hit-and-run driver was accompanied by a woman named Lena Lawson, who just happens to be a British film starlet the yokel has recently seen in Housemaid’s Knee at the local pictures. Cairnes manages to get a connection to Lena’s film studio through his publisher, and through the studio arranges a meeting with her. She in turn leads him to his enemy, George Rattery. To Cairnes’ relief, George is a petty tyrant who hits his wife, bullies his son Phil, and plays away from home. An obnoxious creature. A very, very objectionable man indeed. I’m glad… I shall have no compunction at all about putting his light out. Cairnes sets about getting close to George and his family so that he can prepare for the execution. …the bearded, round-faced man who was holding a lump of sugar in his spoon and watching it crumble and subside beneath the surface of the hot liquid. George reveals himself as even more obnoxious than Cairnes believes: a thoroughly deserving victim. The streets of Severnbridge dozed interest midday sunshine… Even when Nigel Strangeways began to sing, mezzo forte, the Ballad of Chevy Chase, it caused no sensation – except in the bosom of Inspector Blount, who quickened his face and began to wear a rather hunted look. Strangeways is given a measure of depth by the occasional passages describing his wife’s concern for him – apparently only she sees the strain he is under. I wish to God, she thought, he’d not come down here at all, he’s tired out and he’ll be in for a nervous breakdown if he’s not careful. Strangeways and Blount are working with a small pool of suspects: ‘Felix Lane’ and his incriminating diary, the business partner Carfax (cuckolded by George), the down-trodden wife Violet, the ex-lover Lena… the case is far from clear. Until the final few pages, I was beginning to think Blake had turned in a straightforward detection novel with a moderately interesting gimmick tacked on to the front. But then the final twist hits you, and it’s pretty clever… one of those that makes you flick back through the story, just to check. Gallery | This entry was posted in Classic mystery book review, Golden Age detection, Witness Statements and tagged 1930s, Cecil Day-Lewis, CWA top 100, John Lehmann, Nicholas Blake, The Holiday Library, UK. Bookmark the permalink. Rich – I can see why you think of this as a keeper. It sounds like a really good story and I’m a sucker for a well-planned twist in a story. Thanks. I’ve never quite got into Nicholas Blake but you do make this book sound interesting. I ought to give him another go as he is well regarded. Great review – This is one of my favourite Blake novels. good point about the humour, I had forgotten that. Thanks – I think Blake’s on a par with Crispin when he hits his stride. This is obviously more serious than others in the series.